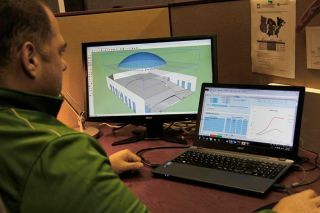 Primacoustic is now offering a comprehensive room acoustics analysis service that can be accessed through the company's website. "Most people realize that they have a problem in their room, but do not know how to identify it or come up with a solution," said Steve Dickson, Primacoustic market development manager. "For instance, they may have a restaurant that is so noisy patrons are unable to converse during a meal. Another example could be a boardroom with a video conferencing setup where the echo in the room is so pronounced, that you cannot clearly understand the orator at the receiving end of the transmission. "By enabling the user to go online, prompting them for the required information along the way, we can quickly identify the problem and come up with a suggested fix. So far, we have been receiving multiple requests daily from the U.S., Canada, Europe, and far-off places such as India." This free service invites the user to fill out a series of questions that will be used to determine the acoustic issues with the space. Questions cover the purpose of the room, the size of the room, wall surface measurements, and existing floor and ceiling materials. A description of the way in which the room will be used, as well as an explanation of the acoustical issues that need to be resolved in the space, also form part of the information required for the analysis. Once filled out, the form is sent to an acoustic specialist who will engage with the user to review requirements and then provide a room analysis along with suggested materials and estimated budget for the installation. To use this service, users can visit the Primacoustic website and click the "Get A Quote" button at the top of the home page.